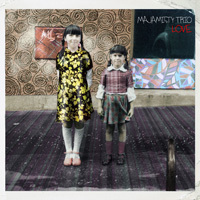 The cover of Majamisty Trio’s Love shows two sisters standing side by side, smiling at the photographer. I assume they are sisters and one of them is probably the pianist Maja Alvanović. Their formal pose, their uprightness, their shyness contrasts so gently with the supple, graceful, confident music of Love. Yet childish things are close here too – do you remember twirling round and round til you were dizzy, playing hopscotch and never stepping on the cracks and best of all, jumping in puddles and whooping with joy as you splashed the grownups? Such memories subtly creep into the rhythms and tempo of this elegant album by Majamisty Trio from Novi Sad, Serbia. Love is an album as intoxicating, heady and bewitching as a shot of plum rakija, its many influences from Balkan folk to classical to Scandinavian (with every kind of dance in between) combining to create a ravishing album. An album which puts this piano Trio very firmly on the map for those of us who are new to them, although they were already there with their debut album Mistyland. Each composition (all by Maja, with some collaboration with her band) is a painting, telling a story, as complete as a symphony. Take Rain Dots, the piano as delicate as mist, Aleksandra Drobac’s vocals flute like an exotic bird, strings and percussion mimic other birds in the forest. The title track Love makes a very grand statement, its mournful billowing trumpet striking and moving. There is a lightness and delicacy about every instrument and voice as if everyone has been told to imagine their instruments are made of glass. A simply beautiful album of glorious melodies, haunting wordless vocals, and delicious edgy cameos blending effortlessly with a perfect trio. It will be on my list of Albums of 2014.